Category Archives: NATURIZING – my “How-To System” for sharing my passion for nature, art and journaling. NATURIZING: A word I made up to describe what it is I do – which is combining my passion for exploring nature with my love for art, nature journaling and sharing the beauty I discover with others. If it was a snake it would bite you! This is what my mother always told me when ever I was looking for something that was right under my nose. Being a want-a-be herpetologist I always loved that saying, but never forgot the connotation that maybe I was looking too hard! No, the Snake isn’t dead – it’s just tired of trying to crawl away! Finding a good subject to draw often seems more difficult than it need be. 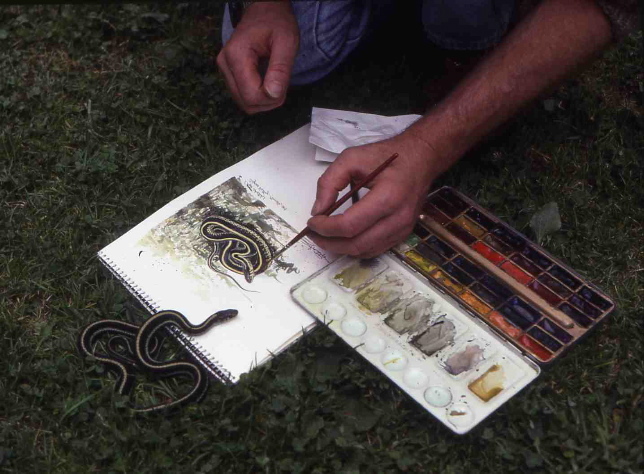 Even if you know what you’re looking for it’s often right under your nose – like that snake my Mom was always referring to. There’s an old saying, “if y’er look’n fer it you’ll neber find it.” Well, I’ve proved the truth of that saying time and again! 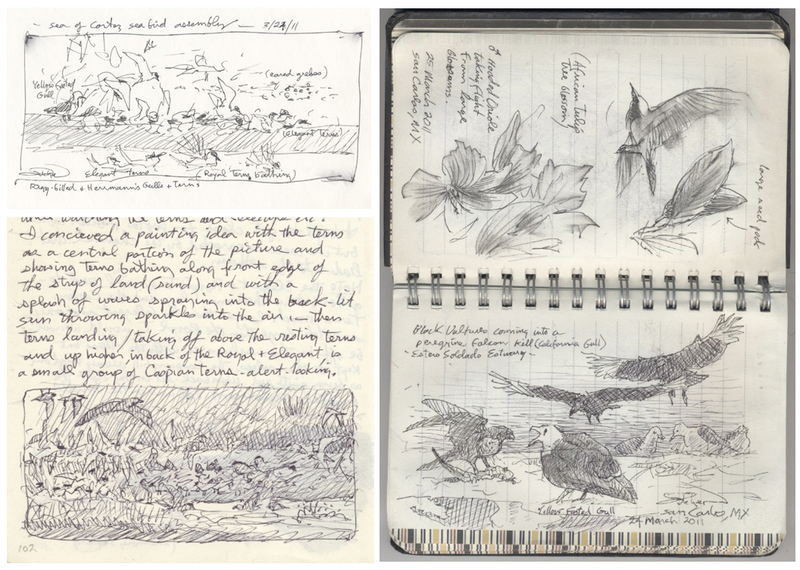 So, if you have the itch to get out and sketch nature but don’t know where to start, then I suggest you do what my artist friend, Lynn Waltke, recently told me, she said, I just want to “go out and do some sketching in whatever field I can find!” Good idea Lynn … Grab your sketchbook or field journal and follow me! Wait… I’m getting ahead of myself. I first want to talk about my approach to going out and looking for a subject. 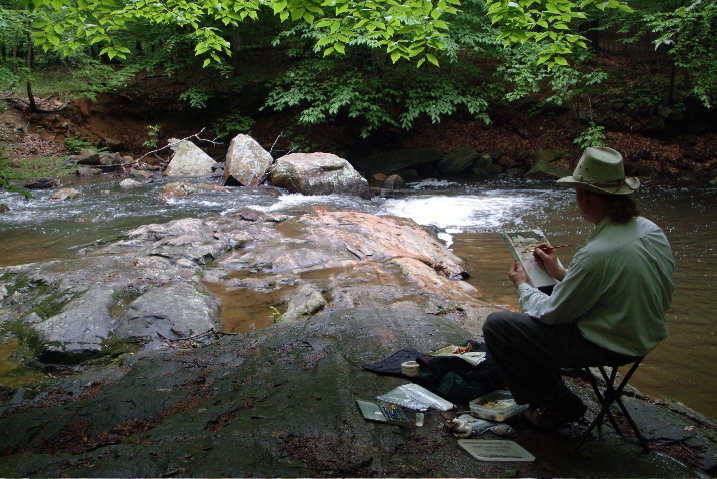 Sometimes I’ll go out looking for a certain type of bird, plant or habitat to gain more reference for a painting in progress, but more often I’m out exploring wherever inspiration leads me with this thought in mind: the success of my studio paintings are directly related to my knowledge of and field experience with my subject. Therefore, my goal is to do more than just find something to draw or paint, it’s to explore and record what I find of interest in a given area, gaining knowledge and first-hand experience in the process. 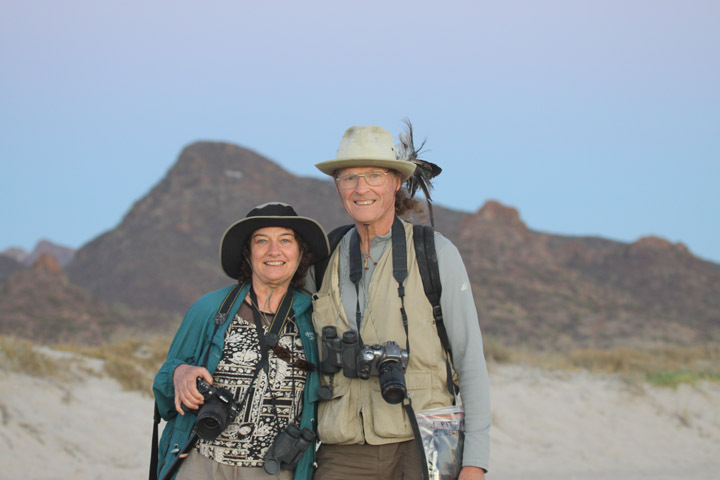 For years I was an avid birder, so any exploration was all about finding birds – that made me predisposed to looking for them. Now I’m more of a “generalist”, with a focus on birds, but just as interested in a new flower or some strange lizard! If you are like me (God help you) and interested in everything in nature, then the great outdoors might be a bit overwhelming. I need a way to break things down into more focused units of study; allowing myself time to take things in. There are many ways of finding a subject, but if you are with a friend who is also an artist (like my wife and best friend , Sue Westin) you can walk and look together for something to catch your eye but eventually you will need time and space to process your discovery. For me this is best done alone without the distractions of a shared experience. When I’m on an art adventure with Sue, we will usually start off together but nearly always end up solo, then by hand radios we arrange to rendezvous later. When I first walk into an area I assume everything alive is aware of my arrival, so I’ll look for a nice place to sit down and wait for the critters to come out of hiding. My Dad first taught me this as a youngster when he’d take me out Squirrel hunting. He called it “still hunting”. After about ten or fifteen minutes the woods would start to come alive again. I no longer hunt but still use the technique. Here is how it works. “Still Hunting” with a brush. 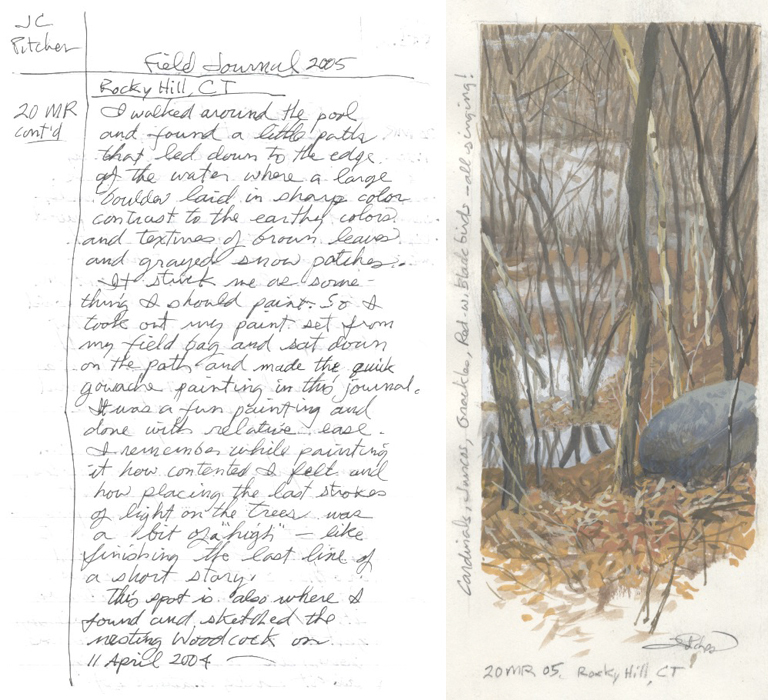 Reading the Field Journal text above reveals my attraction to an area of color and texture, inspiring me to making a small landscape study in my field journal. I made this study because I knew in doing so I would make a right brain “cognitive connection” with the natural world around me. I painted atmosphere while breathing it in, spring smells and earth colors mixed into one memory, as the birds came out of hiding they added melody to the mix. I now associate Cardinals, Juncos, Grackles and Red-winged Blackbirds with the smells, colors and textures of Spring’s vernal pools and melting snow. If you wait they will come! 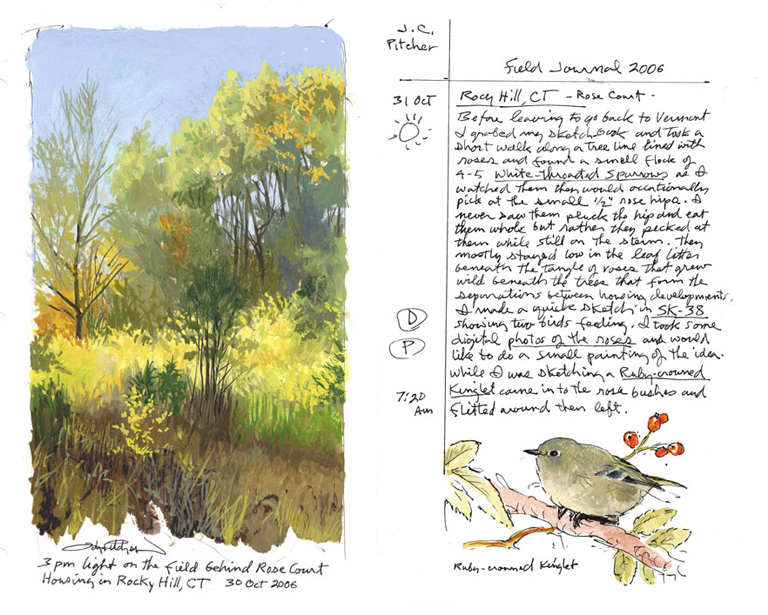 Another example of a journal painting from where I sat down and waited for nature to reveal ideas to paint. I don’t always just sit and paint, sometimes I slowly and quietly walk around with my binoculars looking and sketching while exploring the many different treasures to be found. 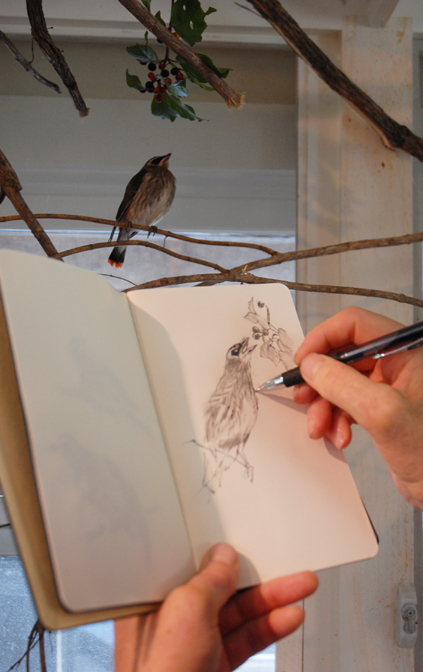 It seems like as soon as you start sketching something it’s not long before other things will catch your eye, like this kinglet that popped up for a peek. These little “happenings” might be the beginning of a new idea or just part of the learning process. 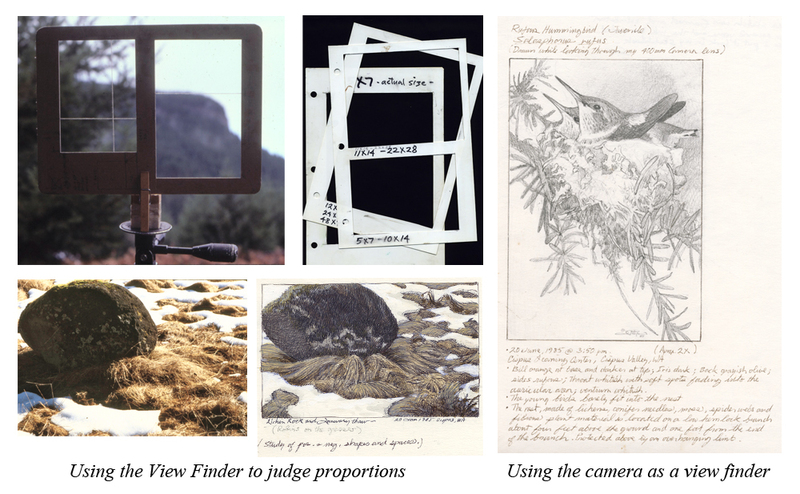 When drawing landscapes or scenes with complicated shapes you might want to try using a view finder. The examples show ones I have used in the past. I would mount them on my tripod so my hands were free to make the drawing. You can buy view finders but I make my own from thick plastic, with cut-outs the same proportions as my canvas sizes. I can then place the VF on my paper and trace out the rectangle so my sketch proportions will match what I see through the finder. The sketch can later be enlarged directly to a canvas of the same proportion. 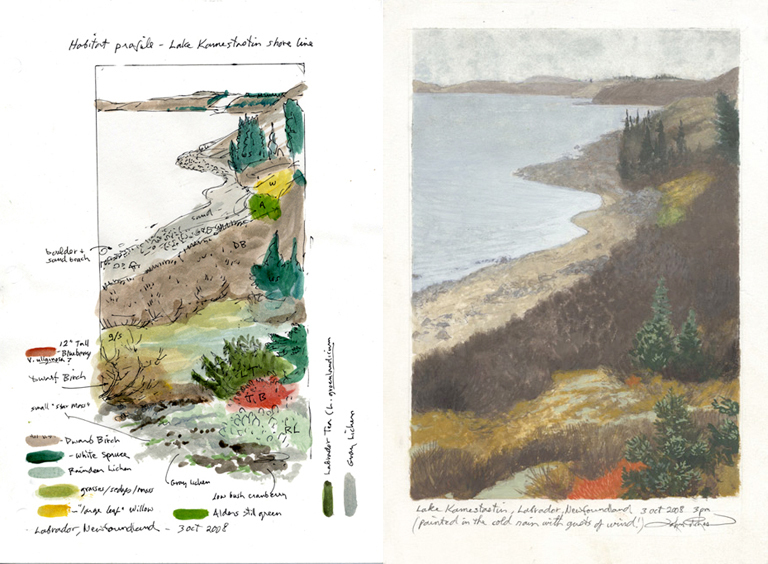 Labrador tundra shoreline and plant study. After a while I have a collection of sketches, photographs and small location paintings. 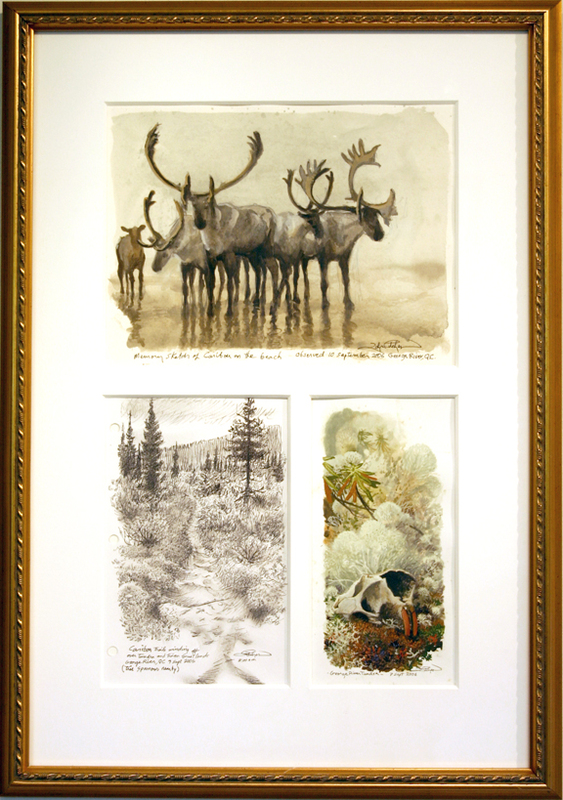 From these references and the new experiences gained collecting them I will start getting ideas for studio paintings. Thumbnail location sketches from my small pocket journals. While still in the field I’ll sketch out small thumbnail compositions to play around with different themes. This way I won’t forget about an idea, but, more importantly it helps me focus on what other sketches and photo references I may need to acquire before leaving the area. There is nothing more frustrating than getting back to the studio only to find out you don’t have all the references needed to finish an idea. 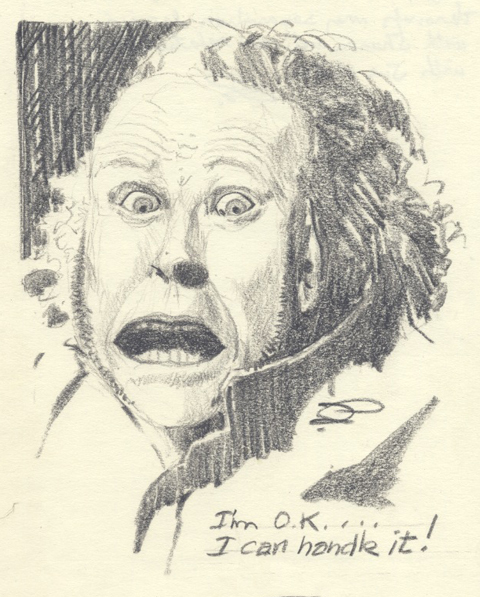 I don’t think being flustered over finding a subject is like the “White Out” experience I blogged about earlier, where one is afraid to start a drawing – although it’s related if one is afraid they won’t find anything worth drawing. Does that little voice inside you keep telling you to stop wasting time wandering around with a sketchbook when you could be back in the studio painting – making money? Well, tell that “little voice” that Andrew Wyeth spent a lot of time wandering around with his sketchbook and he managed to find time in the studio and make money! Jean Shadrach, an artist friend and early mentor of mine, used to tell me, when I’d complain about how hard it was to find a suitable (salable) subject, “don’t worry, John, about what you draw – I believe you can turn anything you choose to draw into a work of art” It took me a while to buy into that statement and realize the truth in it. She was right, not because she felt I was a good artist, but because she knew from her own experience that a sense of design and aesthetic will instinctively find its way into an artist’s work, even their preliminary sketches. It may take time to trust and believe in that but it’s well worth remembering. 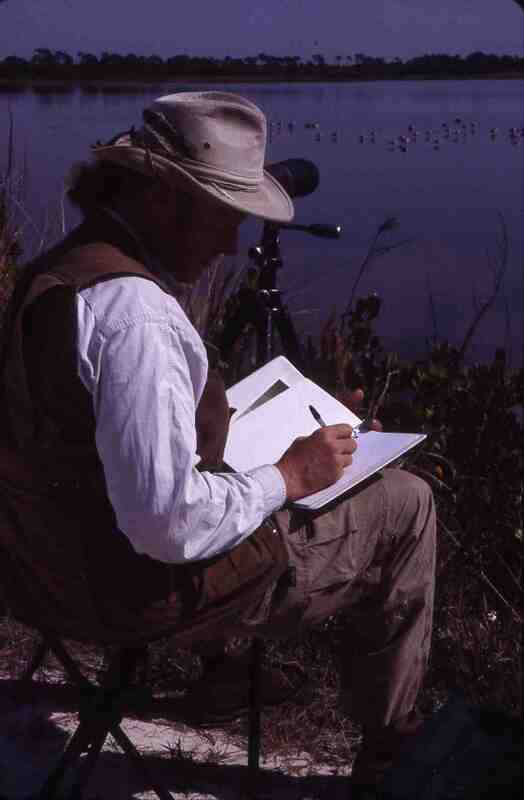 Good luck sketching on your next adventure – may your pencils always be sharp and your binoculars in focus! WHITE OUT – Page Fright! When I stare at a blank white drawing pad or journal page it reminds me of the Midwest “white out” snow storms of my youth, and having lived in Alaska for twelve years I can remember snow conditions being so blinding that you almost come to a halt …you know you must proceed forward but it feels so scary! 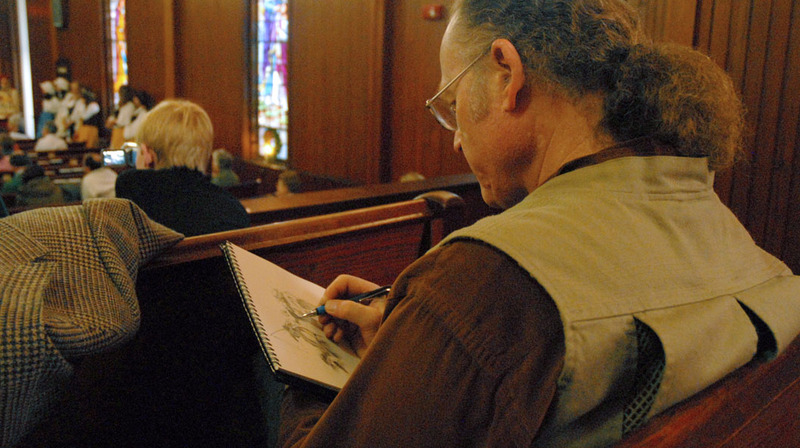 If you’re a seasoned artist you have probably found ways to deal with this but if your just starting to draw nature from life, keep sketchbooks or start a nature journal, it might comfort you to know that any fear of a blank page you may have you do not face alone. Artists and writers alike deal with this in some form or another. Facing that blank sheet – how do I start? It’s different from “writer’s block”… when you just can’t think of what to write or paint. Some artists say it’s the feeling of not wanting to ruin a good clean page in a sketchbook, an expensive sheet of watercolor paper or a page in a fancy empty book that causes such a stressful beginning. 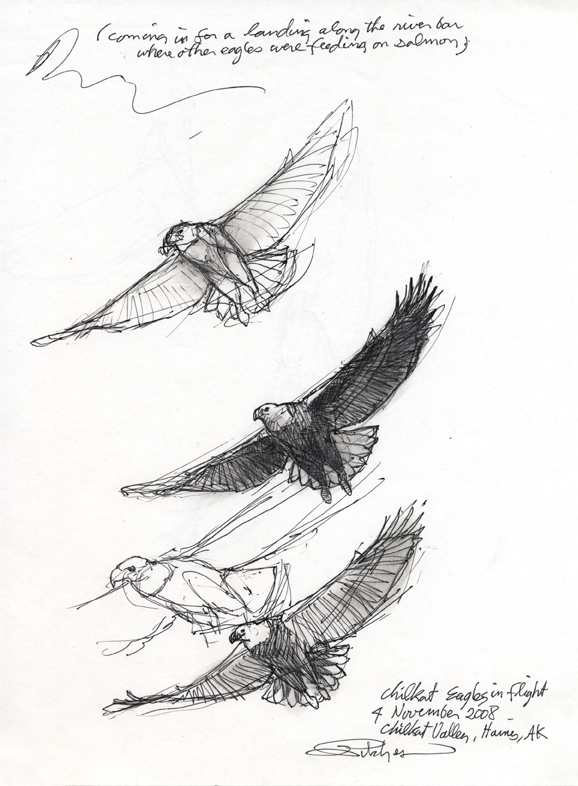 When I first started sketching outdoors a combinations of things caused “White Out”: little experience in drawing moving objects, not being very familiar with my subjects (birds), and an unhealthy fear of failure as an artist. I fed my fears with that little voice inside of me, whispering, ” you can’t draw very good and to try will only prove it!” I also questioned if my subject was important enough to justify marking up a clean sheet of paper… “Little Voice” might say, “maybe you should draw on scrap paper; therefore, if it doesn’t turn out you’re not wasting another page with a silly little sketch”. That approach may seem to make sense at first but it implies that I ‘m not good enough to use a”real” sheet of paper! I needed to learn how to control such negative thoughts, not feed them. Alternatively, start by using an inexpensive spiral bound sketchbook to just practice drawing in. Think of this sketchbook as personal, you don’t have to show it to anyone. A musician often practices just warm-up scales in addition to his repertoire of songs – but he never performs a “Warm-up Scale Concert. Do practice sketches of different things, not just what you like best, all in the frame of mind that they are just “scales”, and do not judge them too harshly. I doubt I will ever rid myself completely of “White Out fears” but I have learned ways to control them … and I know practice is one of the best ways! With me, page fright is mostly psychological. It is about my skill and confidence level – how I view myself, but, what I think others may expect of me plays even a bigger role in dealing with this fear. Over the course of my adult life, not so much my youth, I have been dealing with an inferiority complex about drawing. That said, I know my main weakness is my lack of confidence in my drawing ability. 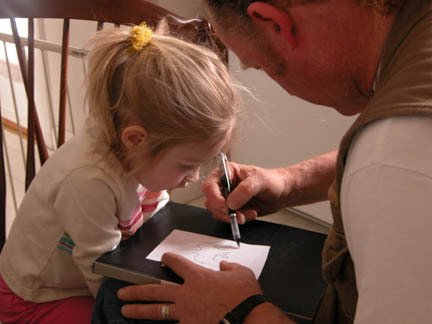 Having never gone to art school (or counselling!) I had to find my own way to deal with this complex. 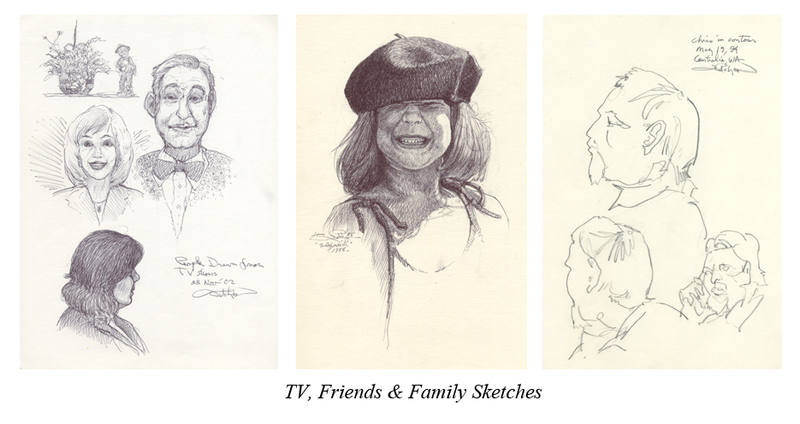 About thirty years ago I reasoned that if everyone else seems to think I’m an artist, than OK I give up – I’m an artist. Continuing that line of thought I reasoned that if I am an artist than “wrong lines” were not mistakes after all, just artistic expressions! At that time I was mostly using a pencil for drawing, which allowed me to erase, and erase, and erase…often ending in a smudgy mess. Now, thinking if every line I draw is an artistic one (in theory) I no longer need to erase. After all, why would I want to erase an artistic line? From that time on I started drawing with an ink pen so as to take erasing out of the equation. Sure it was scary, but by drawing lightly at first, when searching for a shape, then applying bolder lines to define the subject I surprised myself. This technique was much like my pencil work, but now, without the added stress of erasing, it started to build my confidence in drawing. Notice in the above Bald Eagle sketches how all the “mistakes” simply add gesture and movement to the work. Also notice the more times I drew it the better it got! Find the pen that works for you. A ball point pen works well for this, but make sure it is “light-fast”. A Bic Ballpoint Pen is not stable and fades with sunlight exposure. I could not find a light-fast ball point pen so I now use various gel-ink pens that I will talk more about in later posts. The pen trick has helped build my confidence as an artist to the point where I now draw fearlessly with a pen or a pencil and erase only to benefit the sketch and not out of fear that someone might think I can’t draw. If the ever-expanding universe is God’s creative energy at work, as I believe it is, then we are part of that energy…free to let it guide our creative desires onto the canvas. Take a creative act of faith and make those first marks!